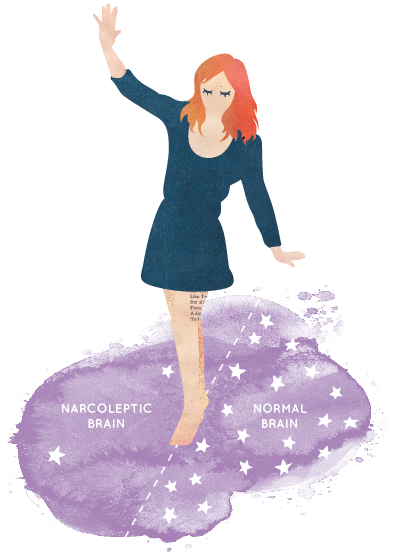 So what causes these sleep issues in the narcoleptic brain? Recent research has shown that the answer may lie with hypocretins (also known as orexin), which are special chemicals in the brain that play an important role in regulating sleep. The brains of people with narcolepsy have been shown to have significantly decreased levels of hypocretins, 85-95% less than normal brains. Specifically, researchers have found that this deficit is due to a lack of specialised brain cells that produce hypocretins. What causes the lack of hypocretin-producing brain cells is still up for debate. Many scientists subscribe to the theory that narcolepsy is, in fact, an auto-immune disorder: the lack of these cells is actually caused by the body’s immune system attacking these specific cells in the brain. But this theory has yet to be confirmed.